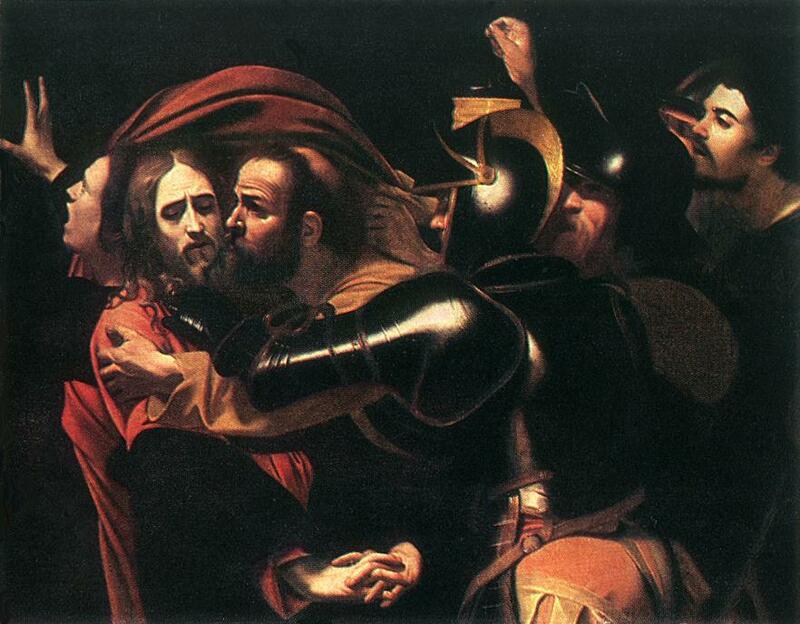 In other exciting news, Caravaggio’s painting The Taking of Christ (also known as “The Kiss of Judas,” c. 1602, see right) was recently recovered (see here). This painting was stolen from Ukraine two years ago, and it recently appeared in Berlin. Two thieves have been apprehended; they apparently tried to sell the painting to a German collector. The recovery is really exciting, but its really disheartening to see the damage incurred by the theft (see image of the damaged canvas at the end of this post). UPDATE: This recovered painting has been reexamined by experts and determined to be a 17th century copy of Caravaggio. See this post for more information. I know that this set will fall into good hands; e has been a faithful reader of my blog for years. Congratulations! Lorenzo de’ Medici: Destroyer of Art? Lorenzo de’ Medici (also known as Lorenzo the Magnificent) is well known for being a great patron of the arts during Renaissance in Florence. 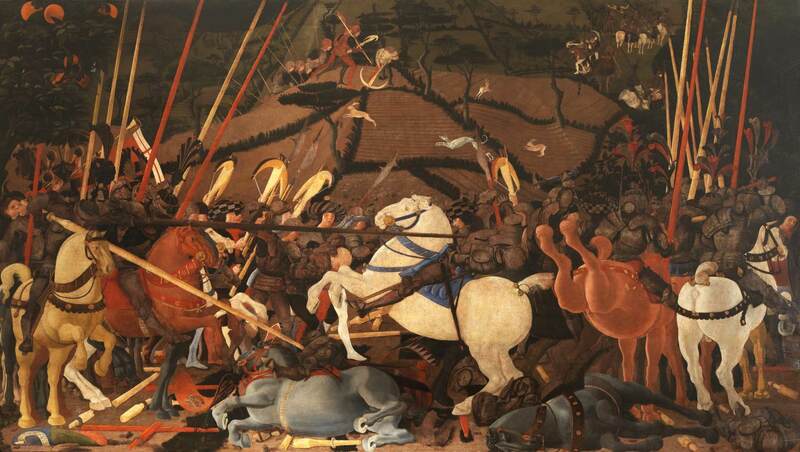 However, it is also supposed that Lorenzo de’ Medici may have destroyed (in part) a series of paintings in his collection: Paolo Uccello’s The Battle of San Romano (c. 1435-56). Do you notice anything curious about these paintings? There aren’t any depictions of the sky, and the large flag in the National Gallery panel has been cropped. 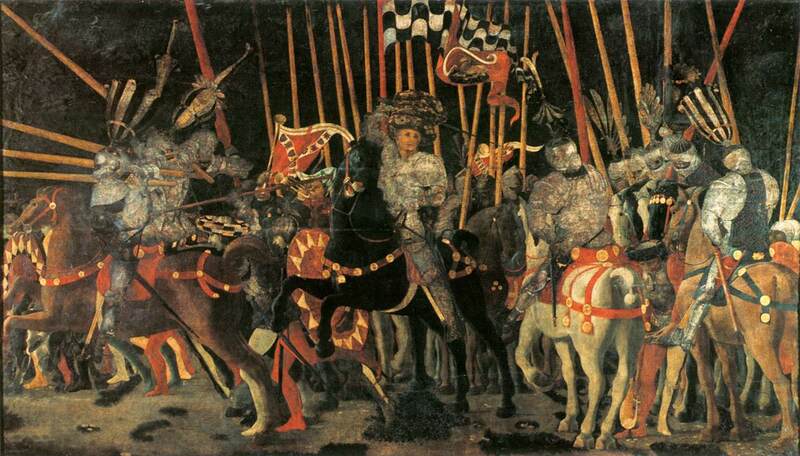 And, surprisingly, the panels were probably cut under Lorenzo de’ Medici’s direction. After Lorenzo de’ Medici gained possession these panels (he stole at least one of them from its rightful owner), Lorenzo probably cropped the paintings so they would better fit on his bedroom wall. Originally, Uccello’s panels were arched at the top (they were originally commissioned to be placed on walls with vaulted ceilings) and likely included bits of sky. Restorer Leo Stevenson has recreated one of the Uccello panels to how it may have appeared originally (see right). Do you like the panel better with a patch of sky? I do. But as J and I watched “The Private Life of a Masterpiece” episode on the Uccello panels, he commented that he actually liked the cropped paintings better. J thinks that the confined, restricted scenes help to emphasize the chaotic feeling of battle. I think this is an interesting idea. Would Lorenzo de’ Medici have preferred the cropped painting for this same reason? Maybe. But it seems like Lorenzo’s motives were more practical than aesthetic. I’m disappointed, though, to know that such a well-known patron of the arts took the liberty to hack off a portion of Uccello’s panels. 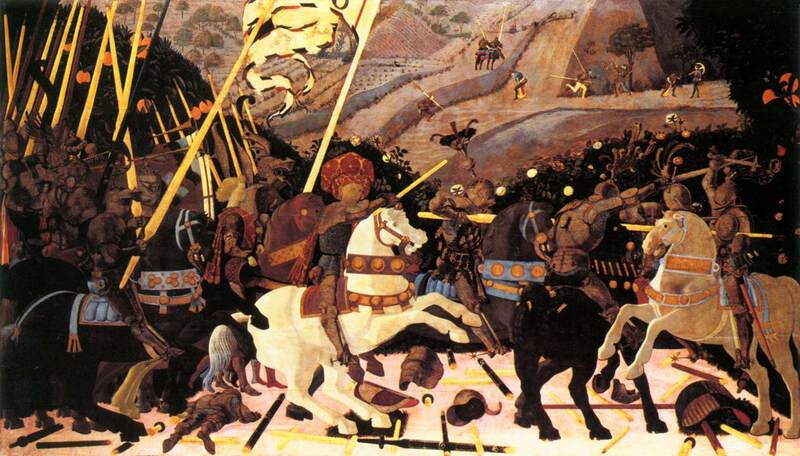 The Battle of San Romano is one of the featured works of art in “The Private Life of a Masterpiece” BBC series. If you’re interested, you can win a copy of this episode by entering my giveaway to receive a free DVD set of “The Private Life of a Masterpiece” BBC series. Hurry and enter! The giveaway ends tomorrow, 30 June 2010. I just finished reading The Genius in the Design: Bernini, Borromini, and the Rivalry That Transformed Rome by Jake Morrissey. It was a pretty good book, although I fluctuated between being bored and fascinated. Morrissey covered a lot of information that I already knew (his discussion of St. Peter’s building history bored me to no end), but he also presented many things that were new to me. It’s always interesting for me to read popular history books like this one. I vacillate between feeling like a scholar (by already knowing the information that’s presented in the book) and feeling like an idiot who doesn’t know anything. I guess such vacillation is good, in a way. There is always more to learn on a subject, and it’s good to be reminded of that. This book revolved around the artistic rivalry that existed between Borromini and Bernini during the 17th century. Although the artists worked together for many years (did you know that Borromini helped Bernini make the baldacchino inside St. Peter’s? ), they eventually had a falling out. The two artists ended up competing for some of the same commissions. 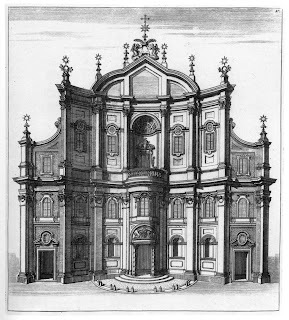 Things turned especially ugly when Borromini publicly and vehemently critiqued the instability of Bernini’s bell towers at St. Peter’s. It’s interesting to realize, though, that although they two artists were rivals, they also undoubtedly influenced the work of each other. 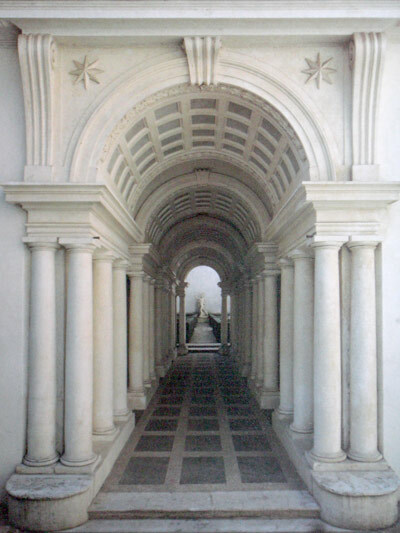 Morrissey points out one such influence by suggesting that Bernini’s Scala Regia (1663-1666) was influenced by Borromini’s colonnade at the Palazzo Spada (1652-53). 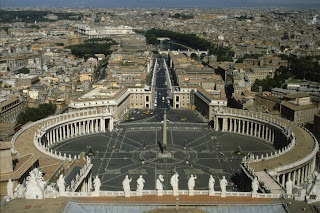 1 Jake Morrissey, The Genius in the Design: Bernini, Borromini and the Rivalry That Transformed Rome (New York: Harper Collins, 2005), 132. Morrissey quotes Borromini’s treatise Opus Architectonicum (Joseph Connors, ed. Milan: Il Polifilo, Trattati di architettura, 1998). 2 Howard Hibbard, Bernini (New York: Penguin Books, 1965), 155. 3 I realize that other architectural theories exist which compare architectural forms to the human figure. Even the ancient Roman writer Vitruvius compared the proportions of the Classical orders to the human form. Admittedly, Borromini is not the first architect to come up with this comparison between the human form and architecture. 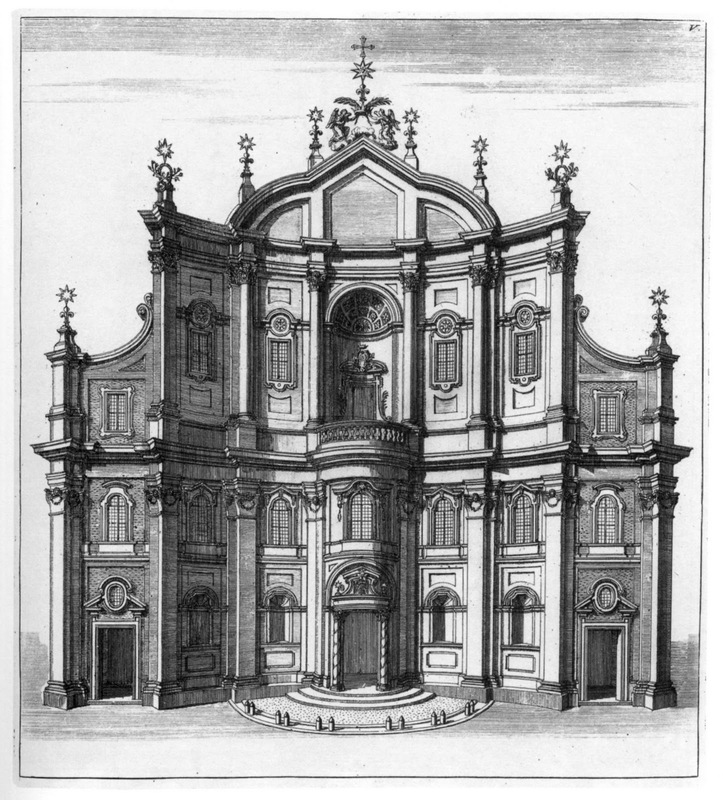 However, I wonder if Borromini could have been the first to incorporate the welcoming outstretched arms in architecture, particularly in its propagandistic role for the Counter-Reformation. If that’s the case, then Borromini has once again been relegated to the sidelines, since most people associate this propagandistic idea of Catholic arms/hugs/embraces with Bernini’s piazza. Like many other art historians, I have learned that Vermeer probably used the camera obscura to help in the creation of his art. However, I recently learned that Vermeer also employed a simpler and more rudimentary method to help him create perfect perspectival lines. To start, Vermeer would often use a pin to create a small hole at the vanishing point within each painting. Of the 35 known works that exist by Vermeer, approximately half of his paintings still have pinholes that can be seen with the naked eye.1 In The Art of Painting (c. 1666, shown right), the pinhole (and therefore vanishing point) is underneath the female model’s right hand, close to the knob for the map holder. Vermeer probably attached a piece of string to the pin that he stuck in his canvases. 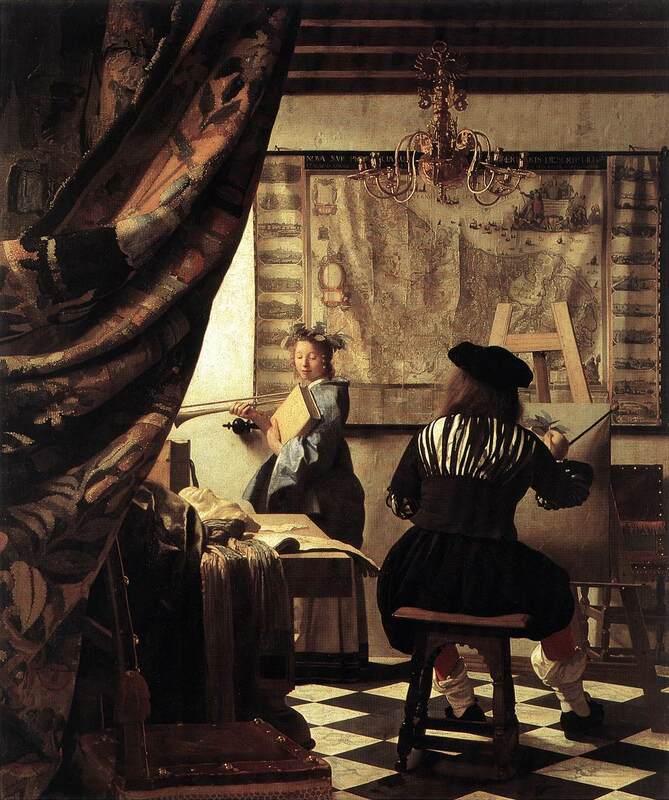 By using string, Vermeer could create perfect orthogonal lines which would converge at his pinhole. If one recreates the string-and-pin method on The Art of Painting, the perspectival lines of the tiles and table perfectly align with the pinhole as the vanishing point. Some scholars like Robert D. Huerta have even gone so far as to say that Vermeer might have put chalk on his string (see first full paragraph of link), and then snapped the taut string to leave a chalk line on the canvas. This way, Vermeer would have had an easy (and erasable) marker while he worked to create an illusion of space. It seems like Vermeer was a pretty clever guy. After all his work on perspective though, one thing about this painting strikes me as funny: have you ever noticed that the artist in the foreground is disproportionately large in comparison with the female model? If the artist stood up, he would be twice the height of his model. Do you think that Vermeer was so focused on creating the perspectival illusion that he didn’t notice the figural disproportion? The National Gallery of Art’s website defends Vermeer by saying that the disproportion is symbolic, emphasizing the artist’s central role in the allegory. Perhaps that is the case, but the gigantic artist always catches me off guard. 1 “The Art of Painting” episode in the BBC series The Private Life of a Masterpiece (2008) reports that 17 paintings have pinholes that are visible to the naked eye. This seems to be the most up-to-date information on the topic. Essential Vermeer mentions that 13 paintings contain pinhole images (including ones visible through x-ray), but appears to be citing an earlier source from 1995. See Jørgen Wadum, “Vermeer in Perspective,” in Johannes Vermeer edited by Arthur Wheelock, New Haven: Yale University Press, 1995, 67-79. The Art of Painting is one of the featured works of art in “The Private Life of a Masterpiece” BBC series. One of the fun things that I learned from his episode was that the red undergarments of the artist (look at his legs) were a mark of fashion. Red was a preferred color for clothing at the time, since red looked warm and cozy. If you’re interested, you can win a copy of this episode by entering my giveaway to receive a free DVD set of “The Private Life of a Masterpiece” BBC series.